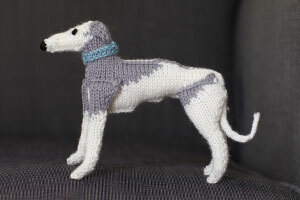 The Whippet, known as ‘the poor man’s racehorse’, is the perfect dog: friendly, gentle, loving and lazy. They like short bursts of exercise followed by a lot of lounging, stay close to their owners and will sleep in bed with them if at all possible; my Whippet also sings. Due to their elegant lines, Whippets feature in many paintings by artists from Pompeo Batoni to Lucien Freud. Well-known Whippets include Misse and Turlu who belonged to Louis XV, and my dog, Lily.